The area between Bader Way and the River Loddon is known as Mortimer’s Meadow. 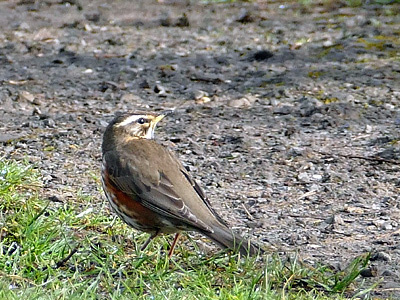 It is rough grassland with patches of scrub, wet and sometimes flooded in winter or after prolonged rains. A path runs from the south end of White Swan Lake across the southern tip of the meadow to Woodley. It is outside the main country park and little watched for birds, partially due to the almost constant disturbance from free running dogs. Magpies and Woodpigeons are known to breed in the vicinity and it is not unusual to see up to 20 of each species around the meadow. Great Spotted Woodpeckers can often be found foraging around the dead trees and Green Woodpeckers sometimes scour the meadow for ants and other insects. 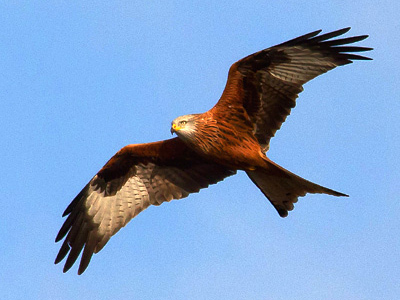 In common with just about anywhere else in the local area, Red Kites are a regular sight, circling overhead. 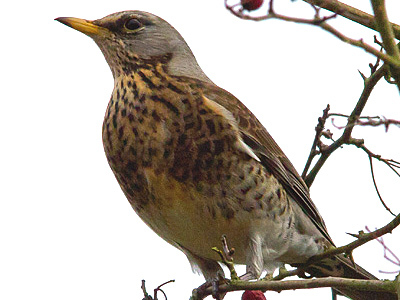 The hedges and scrub attract breeding birds like Chiffchaff and Robin during summer, but possibly the most interesting time for birdwatching is in the winter months, when decent sized flocks of Redwing and Fieldfare roost in the trees here, along with Starlings. An abundance of flora makes the meadow a good location to look for butterflies and moths, with some rare species having been recorded during surveys in the past. If you have any information relating to wildlife on this under- watched part of the park, please do not hesitate to share your findings with us.